A top Iranian commander said on December 4 that Iran will dispatch a fleet of warships on a joint operation with Russia in the Western Atlantic Ocean. Many see Iran as a mere regional power. Yet as the successors to the Persian Empire, Iran is showing the world that it sees itself as a global power. A United States aircraft carrier entered the Persian Gulf on December 21. In retaliation, the Islamic Republic announced that it would conduct its own naval operations near U.S. waters. Iran’s government-controlled Islamic Republic News Agency quoted Rear Adm. Touraj Hassani as saying that the operation might take five months and will “secure shipping routes” and “thwart Iranophobia plots.” Hassani also said that the newly built Sahand destroyer, which Iran claims has stealth capabilities, would be part of the operation. Iran has also announced the arrival of a new submarine in its fleet. The Tehran Times reported that the submarine “is equipped with an advanced sonic radar system for identifying enemy vessels and uses a missile defense system.” The submarine is reportedly scheduled to come into service on January 29, so it could be included in Iran’s Atlantic operation. Iran’s government-controlled Fars News Agency said that the flotilla is expected to harbor in a friendly country, such as Venezuela. 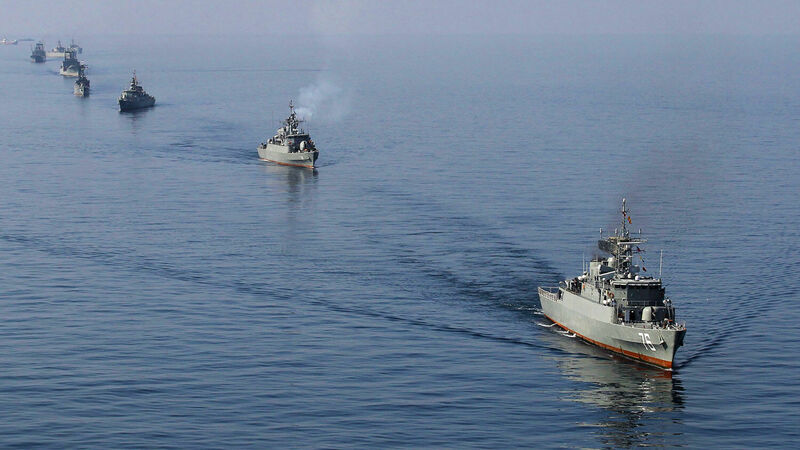 Iran’s ships are a couple of generations behind similarly sized U.S. destroyers, and they have nothing remotely like the powerful strike capability of America’s carriers, nuclear submarines and amphibious warships. Nor do they have sophisticated land-attack cruise missiles comparable to U.S. Tomahawks. Iran is descended from one of the greatest empires in world history. Darius i, emperor of the Persian Empire from 552 to 486 b.c., sought to establish a trade link between the Persian Gulf and the Red Sea. He died before achieving his ambition, but he left his heir, Xerxes i, with a massive naval fleet in the Mediterranean Sea. So far as I know there is not a harbor anywhere big enough to receive this fleet of ours and give it protection in the event of storms: and indeed, there would have to be not merely one such harbor, but many—all along the coast by which you will sail. But there is not a single one. The Iranian people, and certainly Iranian leaders, remember Persia’s glorious history. They wish to see their imperial greatness restored. They desire similar economic and military power, although the nature of their Islamist regime is far different from that of their ancestors. The Persians, primarily under Cyrus’s rule, were known for their religious tolerance. Conquered states were allowed to keep their own religion and way of life, as long as they sent their young men into the Persian army and paid their taxes. Iran’s ayatollah and his regime of clerics do not follow the same philosophy. They impose Shiite religious laws, and their harsh rule restricts the Iranian economy and hinders its people from becoming successful. Instead of religious tolerance and trade, Iranian leaders seek to use religious fanaticism, funding of terrorism, and outsized military spending to dominate the Middle East and beyond. The regime spent over $14 billion in military expenditures in 2017. That is about 10 percent of its gross domestic product; in comparison, Russia spent 4.3 percent of its gdp, and the U.S., 3.1 percent. Due to Iran’s large military budget, restrictive laws, and sanctions for terrorism and aggression, most Iranians live in poverty. Since U.S. President Donald Trump renewed sanctions on Iran’s crucial gas, oil and shipping sectors, the Iranian people have experienced even worse suffering. Nevertheless, the Iranian regime continues to increase its military expenditures and to push its global influence. Due to its radical ideology and the weak U.S. response, Iran will continue to make symbolic, strategic and dangerous expansions of its power. February brings the 40th anniversary of the Islamic Revolution, so watch for more signs of Iran’s ambition for power. Daniel 11:40 says that eventually the Islamic republic’s ambitions will cause it to push too hard against a united European empire. This will lead to a clash, erupting into a third world war.